Pendarren House Outdoor Education Centre Outdoor Pursuits CentrePendarren house outdoor education centre in South Wales is ideally situated for its purpose. The house stands on the southern slopes of the Black Mountains overlooking the Grwyne Fawr valley within the Brecon Beacons National Park. The park covers an area of 520 square miles and includes the Black Mountains and the Brecon Beacons. 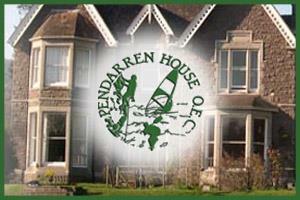 Pendarren house outdoor education centre in South Wales is ideally situated for its purpose. The house stands on the southern slopes of the Black Mountains overlooking the Grwyne Fawr valley within the Brecon Beacons National Park.